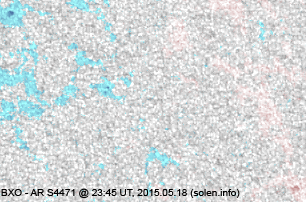 The geomagnetic field was quiet to minor storm on May 18. Solar wind speed at SOHO ranged between 337 and 500 km/s. 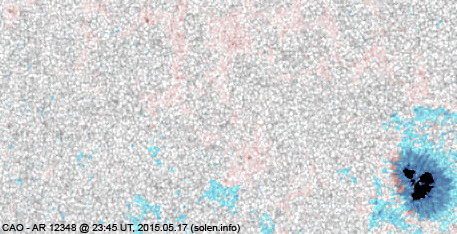 A low speed stream associated with CH668 began on May 17 and continued until about 18 UT on May 18 when a sudden increase in wind speed was observed at SOHO. 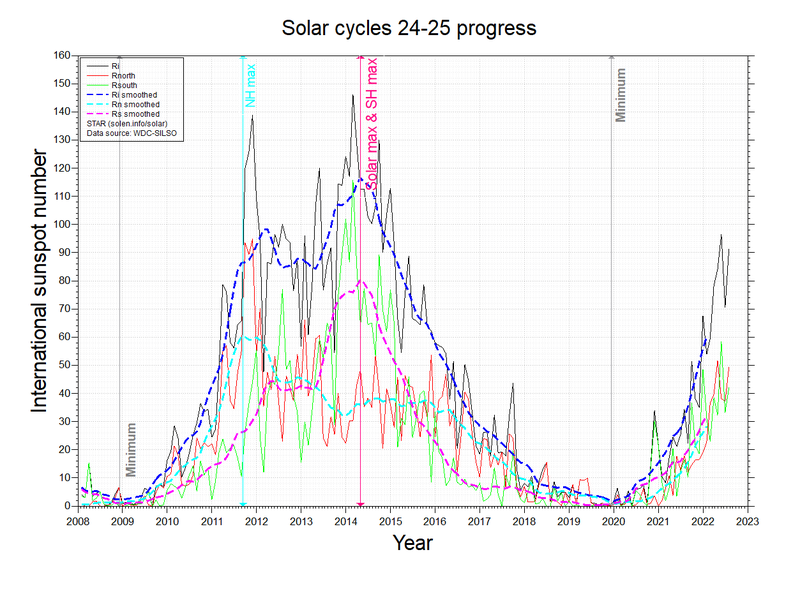 As there was no increase in solar wind density at that time this wasn't a solar wind shock. 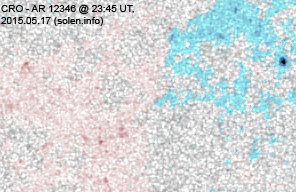 The source of the disturbance could be a co-rotating interaction region associated with CH668. 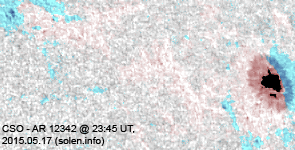 Solar flux at 20h UTC on 2.8 GHz was 115.0 (decreasing 38.8 over the last solar rotation). 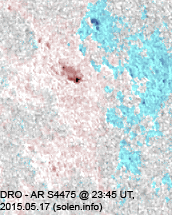 The 90 day 10.7 flux at 1 AU was 127.9. 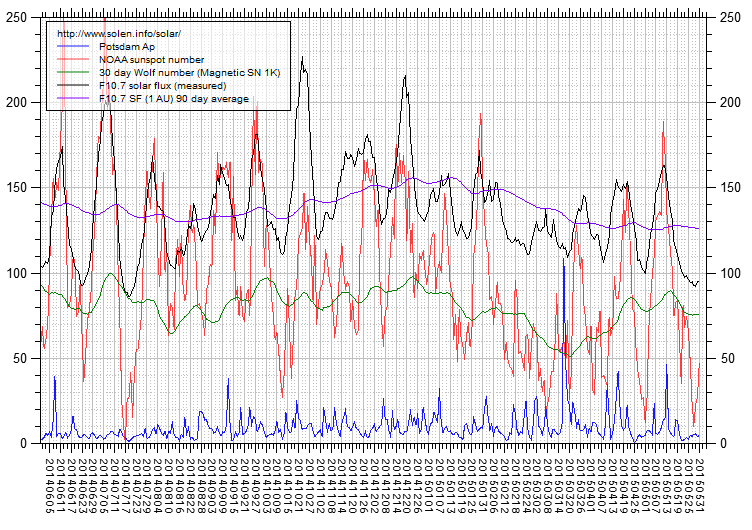 The Potsdam WDC planetary A index was 14 (STAR Ap - based on the mean of three hour interval ap indices: 13.9). 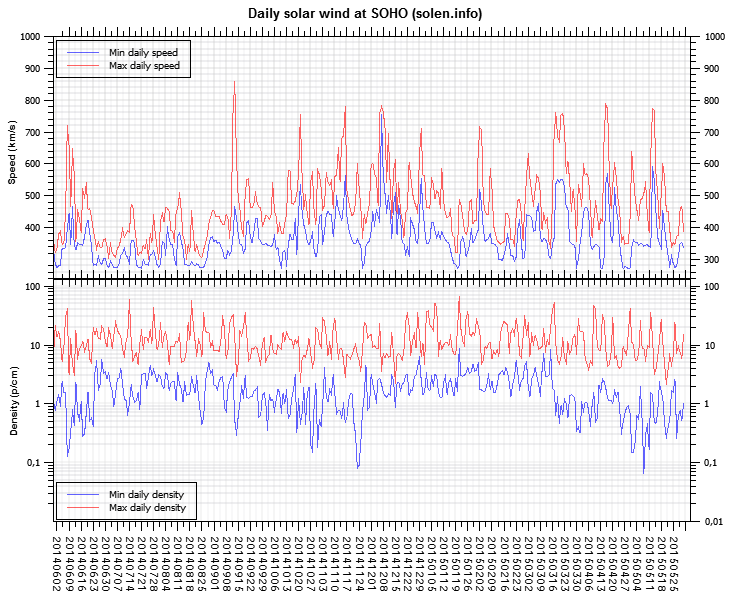 Three hour interval K indices: 21223135 (planetary), 22234335 (Boulder). 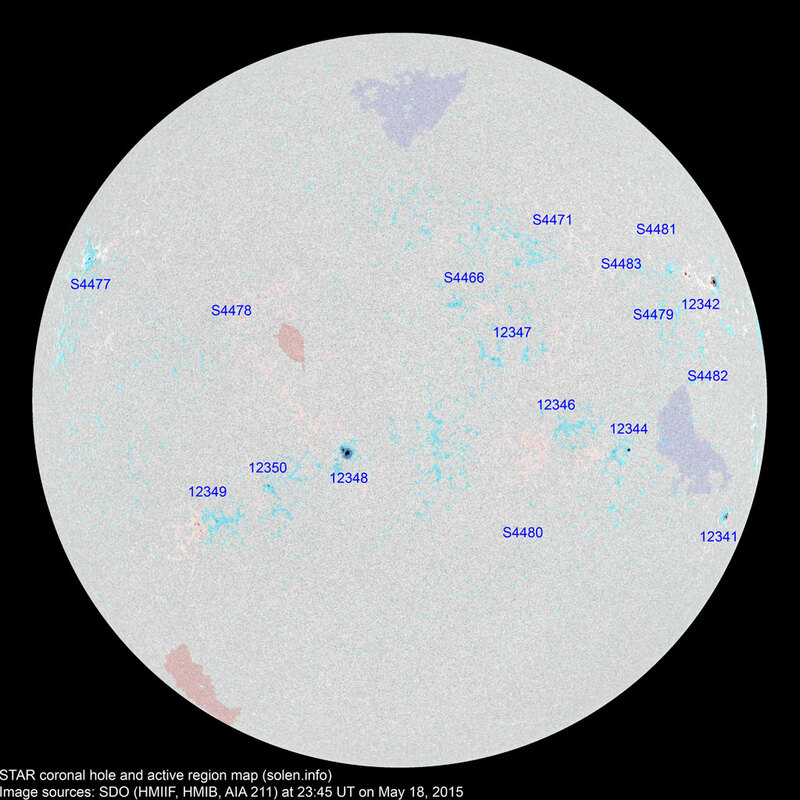 At the time of counting spots (see image time), spots were observed in 17 active regions using 2K resolution (SN: 243) and 14 active regions using 1K resolution (SN: 174) SDO images on the visible solar disk. Region 12341 [S19W70] decayed slowly and quietly. Region 12342 [N17W61] was quiet and stable. 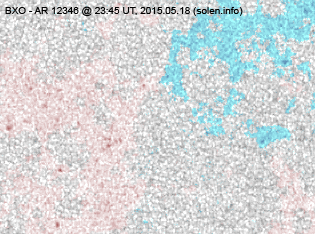 Region 12344 [S10W38] was quiet and stable. Region 12346 [S10W23] decayed slowly and quietly. Region 12347 [N03W19] was quiet and stable. 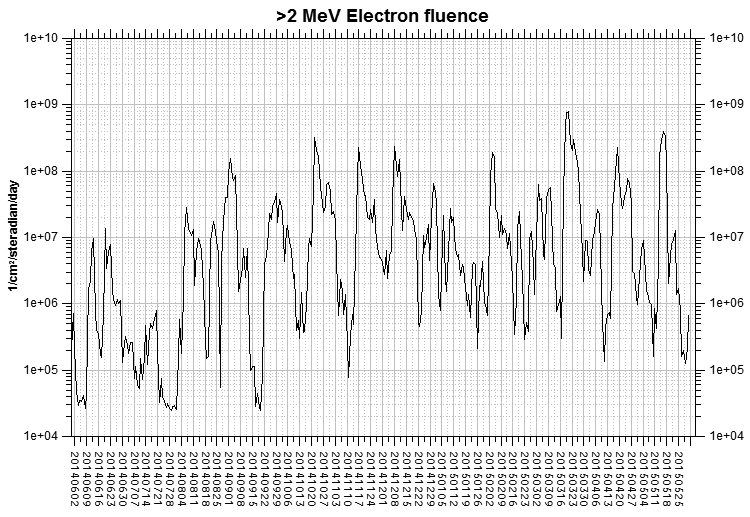 Region 12348 [S11E08] was quiet and stable. 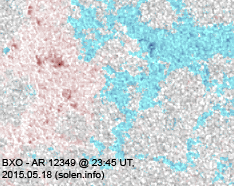 New region 12349 [S22E36] emerged on May 17 and was numbered by SWPC the next day. 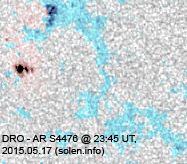 New region 12350 [S17E22] emerged on May 17, then decayed on May 18 when it was numbered by SWPC. S4466 [N12W08] was quiet and stable. S4471 [N19W28] was quiet and stable. S4477 [N21E65] developed slowly and quietly. S4478 [N06E24] was quiet and stable. 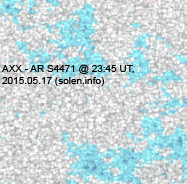 New region S4479 [N08W46] was observed with a penumbra spot. New region S4480 [S20W20] emerged with penumbra spots. New region S4481 [N20W50] emerged with penumbra spots. New region S4482 [N06W56] emerged with penumbra spots. 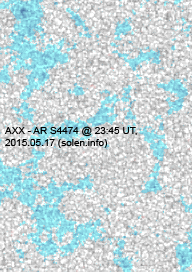 New region S4483 [N16W41] was observed with a penumbra spot. 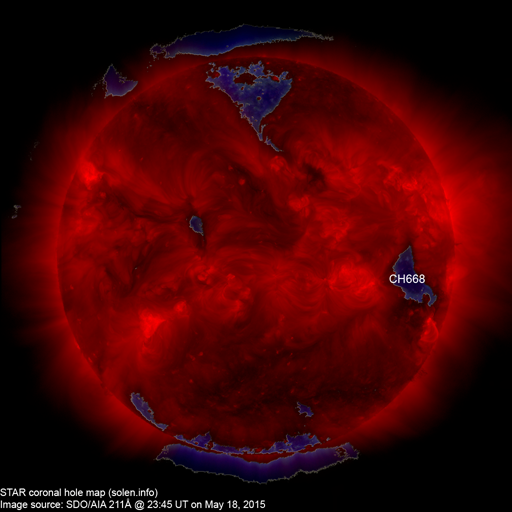 May 16-18: No obviously Earth directed CMEs were observed. 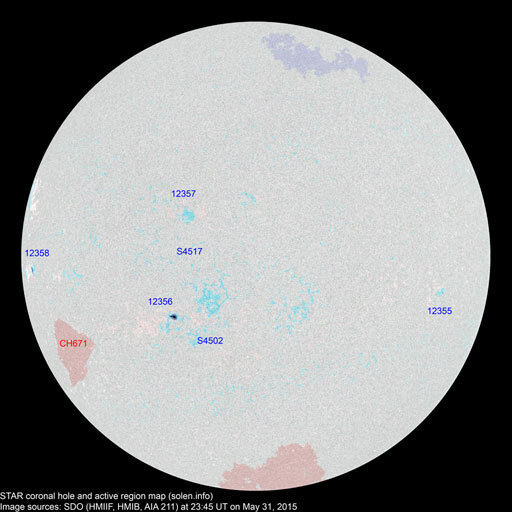 The geomagnetic field is expected to be quiet to active on May 19 due to effects from what is likely a co-rotating interaction region associated with CH668. Mostly quiet conditions are likely on May 20-21.